Blood Dark Thirst clocks in at 24 pages, 1 page front cover, 1 page kort’thalis glyph, 1 page editorial, leaving us with 21 pages of content, so let’s take a look! Okay, the first thing you’ll note upon opening this pdf, is that it’s gorgeous: The layout by Glynn Seall, with its blood tint and splotches, is glorious. There are no less than 7 (!!) full-page artworks within, all adhering to a mostly black-white- and-tones-of-red aesthetic. This is easily one of Kort’thalis Publishing’s most beautiful books; perhaps even the most beautiful one. This may not be a surprise to anyone, but I’ll state it nonetheless: Blood Dark Thirst is another rules-lite modification of Venger’s VSd6-system, which is also employed in Alpha Blue, The Outer Presence and Crimson Dragon Slayer. This means you roll 2d6 for most tasks, with advantages and disadvantages reducing or increasing the numbers rolled. 0d6 means rolling 2d6 twice and taking the lesser result. The system then is about interpreting what happens. 1 is a critical failure, 6 a critical success – “Yes, and”… or “No, and…” are the key words here. 2 is a failure, 5 a success, and 3 and 4 are partial failure and success, respectively. These are the base rules; they’re very simple and easy to grasp, can be explained in less than a minute, and is all you need to know to play. Character creation is similarly painless: You choose three things your character is good at, and thus gets a 3d6 pool; 2 that you’re bad at (1d6) – there is a 20.entry table to randomize these, should you choose to go that route. These are not all equally helpful. Investigation/Perception and Awareness/Alertness are two entries, for example, that could have used specifying for what they’re used respectively. The character gets three flaws (d20 table provided) and picks a quirk that sets him apart. Then you pick your birth, the age when you were turned and mannerisms. A d30 table with a column of male and female names is provided. The game does have a couple of more crunchy bits, though: Each character starts with 6 humanity, looking human; evil acts decrease humanity, at a maximum rate of 1 per night, and humanity 1 means you look like a monster. Vampires can hold up to 6 points of blood, and only one may be spent per round. Rising at dusk actually costs 1 point of blood, so yeah, you will need to feed. A human has 6 blood; 3 may be drained sans medical attention. Often. Also due to blood being the resource to heal. A vampire begins play with 25 Health. Humans regain 1d6 per day, vampires need to spend one point of blood to regain the same amount. Vampires do not die unless decapitated or consumed by fire, so yes, you can be revived! This is important to keep the combat system in check. Who describes first acts first, which isn’t a system of initiative I enjoy –iit results in competitive shooting matches by the players, but that’s just my preference. Damage incurred is based on the attack dice pool size, and damage explodes – 6s are rolled again, results added together. Damage can carry over to others when killing NPCs. Vampires can have up to 6 Willpower, and up to 3 may be spent per scene/encounter, but only 1 per round. New characters begin with 0 Willpower and earn Willpower by roleplaying flaws. Willpower may be spent to resist supernatural effects, resisting bloodlust/frenzy, making a new vampire or adding 3d6 to the dice pool. Frenzy? A vampire down to 3 Blood rolls an additional red d6; less blood means you roll more red d6s. If one of them comes up as a “1”, you enter bloodlust. Here’s the thing: there is power in bloodlust: If the red die comes up 6, the vampire may take the critical success result, provided he is roleplaying the flaw or immediately feeds. Vampires can form bloodbonds, which may enthrall or affect the relationships. Vampiric slaves for blood and a d6 table to establish the grip on the victim is provided. Similarly, a d6 table to determine whether you were seen, and a general list of 6 NPC challenge levels is provided. Leveling is simple and governed by completed story-arcs, here designated as campaigns. The pdf also provides an introductory scenario of sorts that features a handout-ish letter; beyond that, a few words summarize a sketch to develop; this is supported by a d20 table of occurrences in the city, and a d6-table of information about the city’s ruler. The game comes with a nice, impressive character-sheet. Editing and formatting are very good on a formal and rules-language level. This is probably Venger’s best-organized and most concisely presented VSd6-game. Layout is, as noted before, full-color and gorgeous, and the artworks are similarly amazing, particularly considering the low price point. I have never seen such an inexpensive game look so good before. The pdf comes fully bookmarked, and a second, more printer-friendly version is included in the deal. Okay, I’ll freely admit it. I was not particularly excited about this one. I loved VtM’s lore, disliked VtR and frankly didn’t expect to see this game work; Venger tends to gravitate towards a beer & pretzels style of gaming, and looking at the page-count, I expected this to be too rudimentary. It’s not. The frenzy-dice-mechanic adds tremendously to the engine’s usual iterations and just FITS. The focus on being a blood-sucking demon, coupled with the really high turn around of blood points and unreliable victim-grabbing also means that just remaining fed can be a struggle, evoking a grimy vampsploitation “blood-by-the-buckets” feeling that distinguishes this from VtM et al, in spite of the thematic overlaps. This actually manages to feel differently from the game that inspired it and the other Vsd6-games; it is, mechanically, by far my favorite of the bunch. I really enjoyed this game; apart from it’s limited scope and length, there is nothing I really disliked or found problematic here. Thus, my final rating will clock in at 4.5 stars, though I can’t round up for this one. Here’s raising a blood-filled chalice to hoping that our thirst for an expanded version will one day be quenched! You can get this fun, rules-lite game here on OBS! Thanks for the review, hoss. You don’t know how much I missed you! 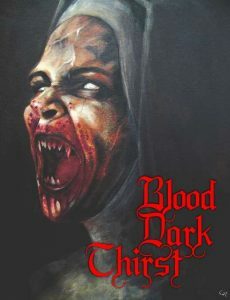 You and several other people are absolutely correct – Blood Dark Thirst needs more. It’s missing campaign setting and world details to flesh out those long nights. One day, I hope to correct that oversight. But for now, I’ve opened the BDT license to anyone who wants to dip their toe in my dark blood… stay thirsty, my friends!